This bad boy snuck out for email subscribers so my apologies for the duplicate. Let’s just say it is good enough to take a peek at twice? 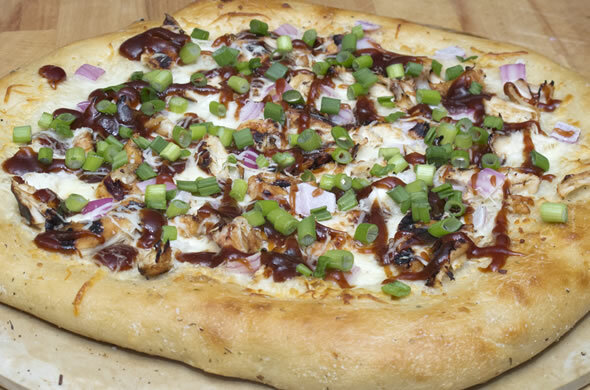 I’m always trying to come up with a pizza topping I haven’t done before. I regularly pass the fig spread in the grocery store but hadn’t grabbed it until now. Until this pizza. Ta-da! Fig jam isn’t with other jellies or spreads…at least at my grocery store. It is usually somewhere near produce on the way further into the store. Preheat oven & pizza stone (if using one) to 400-degrees. 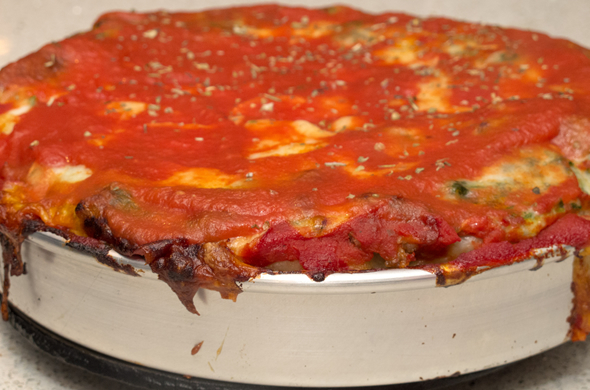 Spread pizza dough onto the pan/stone and poke a few holes into it with a fork or knife. Bake for 10-15 minutes until it starts getting golden and crisp. 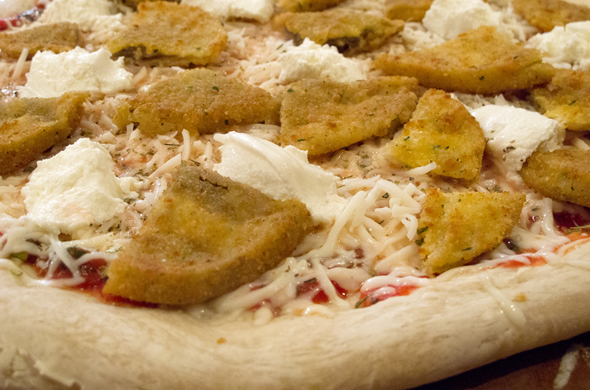 It needs to be crisp to hold the toppings. 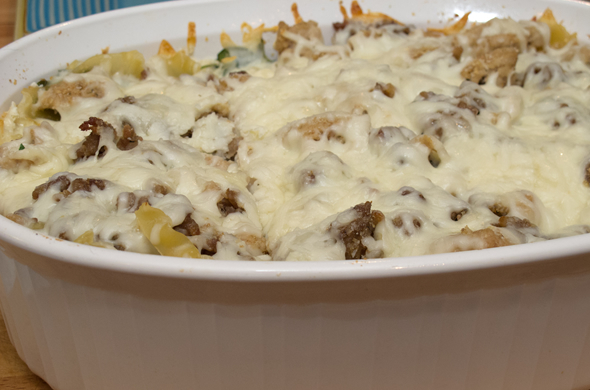 Top with marinara, then shredded mozzarella. Dot with brie and fig jam. Return to the oven, and bake for 10 more minutes. Remove from the oven and let sit for 5 minutes. 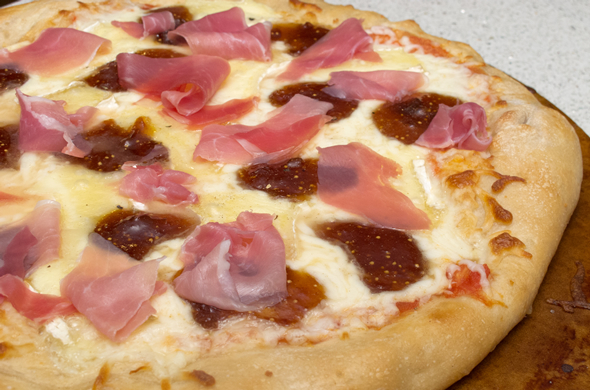 Top with slices of prosciutto. I love the sweet jam with salty prosciutto. This was a great combination of really different flavors. 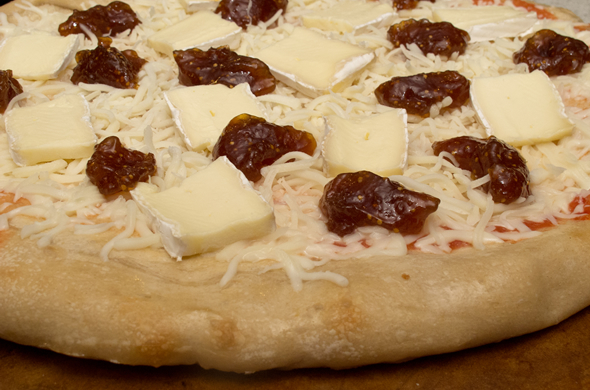 Between the brie, the mozzarella, and the jam, it was a gooey/drippy pizza. I wanted marinara on there for some acidity but that could be optional. 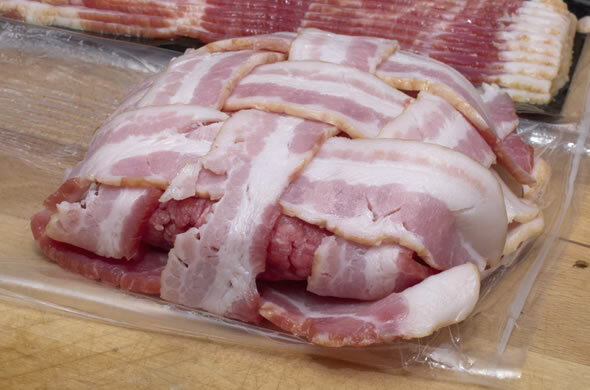 I also think this would be interesting enough without the prosciutto, if you were serving a vegetarian. I always worry that their food isn’t interesting enough. I like the prosciutto uncooked so it is still soft and bite-able. I make a lot of pizzas. Any future topping ideas for me? For Mr. J’s birthday I started a tradition a few years ago of a special burger for his birthday dinner. This year’s burger was a hit! This year I was out of techniques to try so I was all about the toppings. 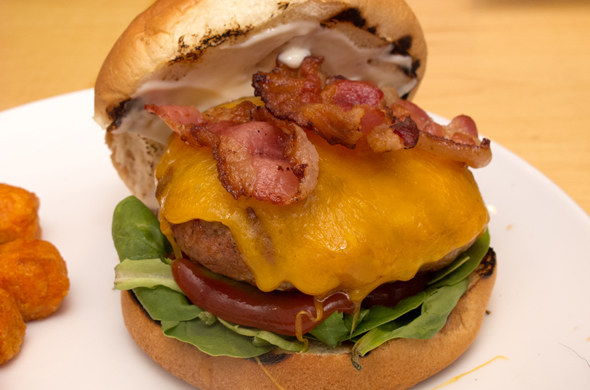 I did a Vermont burger: cheddar, bacon, spinach, and maple mayo. I loved these! The salty bacon pairs perfectly with the sweet mayo and sharp cheese. Ahhh! Bliss! I need another one of these. Right. about. now. Life has just been crazy. We just replaced our boiler and water heater. By we, I mean Mr. J and I got about 4 estimates from troupes of plumbers, researched the state energy credits, went back and forth about the best method/pricing/sources etc. Bahh. It’s pretty boring except that I want to have heat, and I don’t want to pay a million dollars. This has been an ongoing discussion with a surprising number of options and it is FINALLY done. When they finally finished a year three full work days later, we didn’t have power on the main floor. The basement? yup. The upstairs? yup. It was during the crazy monsoon storm and it seemed like power came back, we flipped a switch, and BAM! There was an explosion somewhere. Alarms were going off, the doggies were FA-REAKING out, and we worried about gas lines, the electrical panel, a fire, or whatever else. A call to 9-1-1 later, we had 3 fire trucks, the electrician, the town wiring inspector, and the fire chief at our house. It turns out something happened with the connection to the house. NStar came about 5.5 hours later, replaced it, and we didn’t have to pay for anything. Phew! I was so worried the basement was on fire, or that there was carbon monoxide, or a gas leak, or something else awful. It was such a relief that everything was fine, minus the smoking/sparking street connection. Our new electrician is our new BFF and hung out while it was all happening. Once we knew everything was OK and were just waiting on Nstar, Mr. J just wanted to see the Bruins and I just wanted the food in the fridge to be ok (win & win for both of us). If that experience doesn’t deserve a burger, I don’t know what does…this also all happened on the day I had to go to the dentist. What a day! I’m nicely tan and back from Bermuda. We went on a family vacay that was long over due. It had been wayyy too long since the R fam all went away together. It was just so great to get away, spend time together, hit the beach, and relax. I had a ton of fun and was so happy to travel not for a work event. 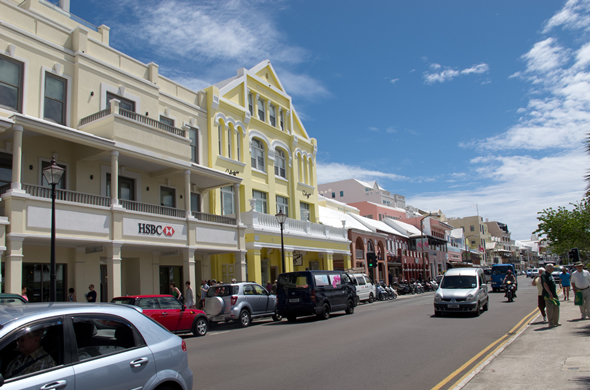 How cute is Hamilton, Bermuda? 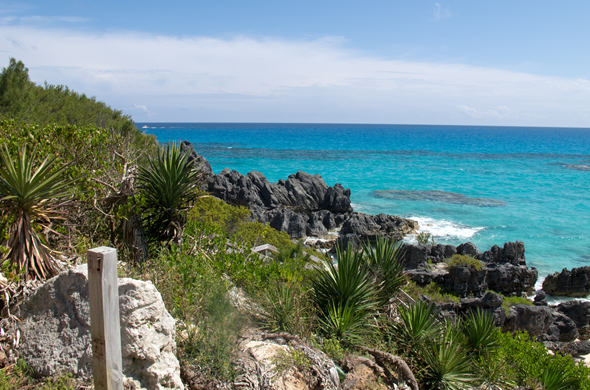 Is it crazy to think Bermuda is just off of South Carolina? It feels like a world away and it seems like the Caribbean. We ate a lot of great food but I had a few favorites to share. I had this app that was listed as lime dressed shrimp over potatoes. 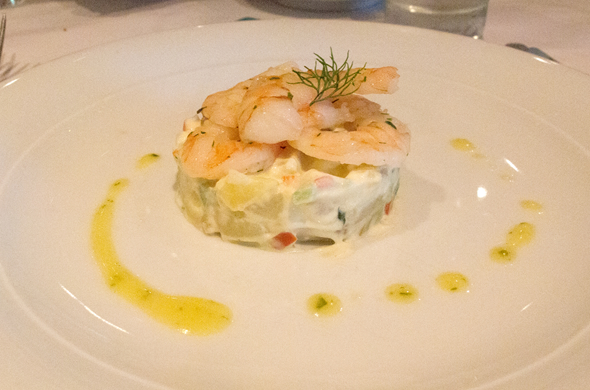 It was citrusy shrimp over a creamy potato salad. I loved it. Dad had it too and we were totally surprised. It wasn’t quite what we expected but we liked every bite. I wasn’t thinking it would be a cold salad at all and that was a great surprise! 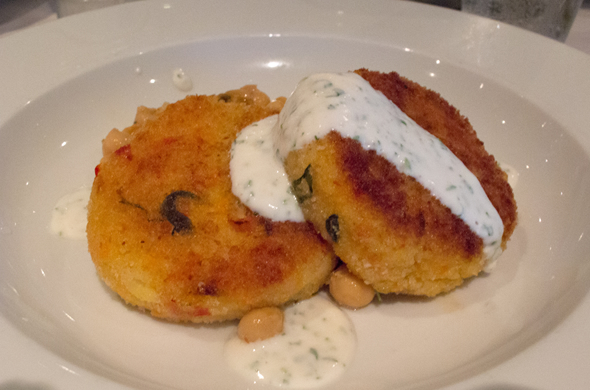 Another favorite dish I had was a chickpea and rice cakes. 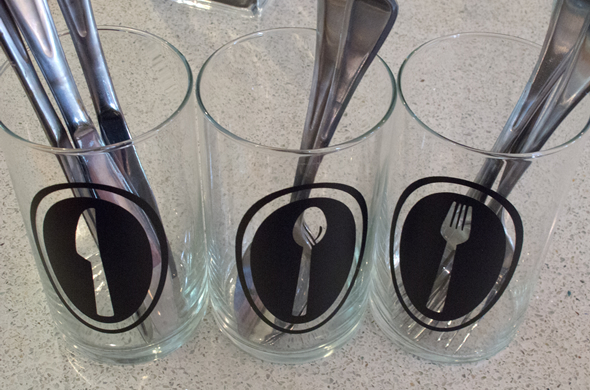 These were served over a chickpea, tomato, and onion salad. There was a light creamy dill sauce over the top. I really liked this entree. 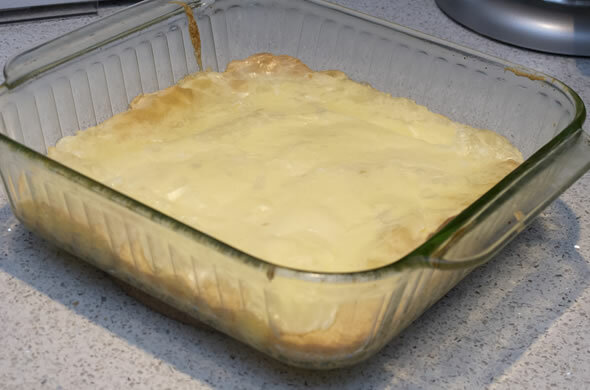 The cakes were warm and crisp with a cool salad and a creamy sauce. It was delicious. On our last night, I spotted a dessert special I HAD to have. 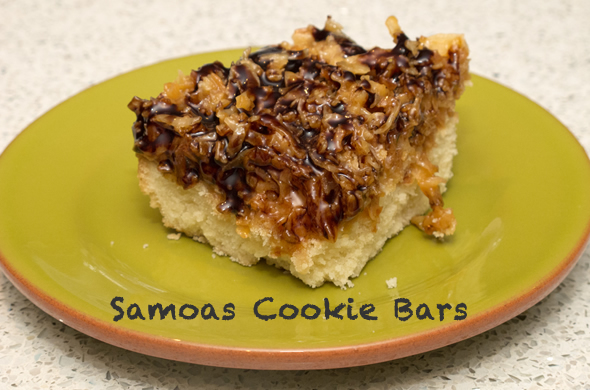 I normally lean towards desserts that are chocolate or coconut. 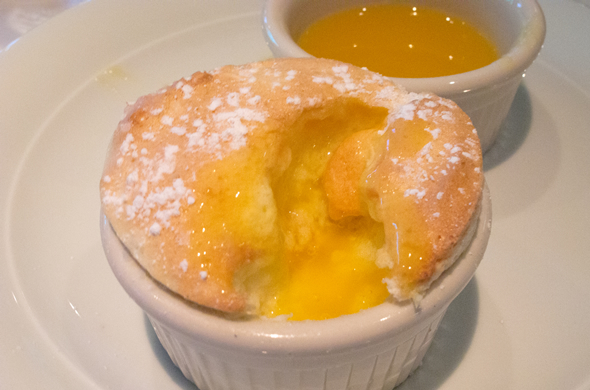 This mango soufflé had me at soufflé. 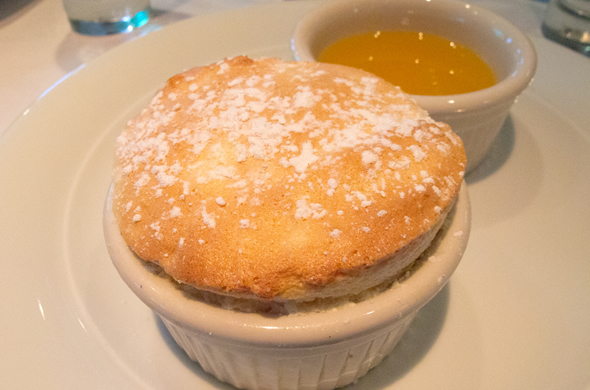 Mr. J proposed with a surprise soufflé in NYC. I spotted this one and it was as good as it looked. It was perfectly light with a fresh sweet mango sauce. This trip was really great. I definitely appreciated a week of down time after such a busy time of year at work. This year was so stressful and anxiety ridden in the office so sun, sand, and 3-course meals with the family was just what I needed. My event is over, I’m back from vacation, work isn’t stressful anymore, and there are no more excuses. Time to eat real food and better food. Time to cut the crap…so to speak. Last night Mr. J was wanting dessert. I was glad he didn’t end up suggesting a trip to our fav local ice cream place. I might not have had the will power to say go without me. I need to get back on track. What a perfect segway to veggie burgers! I love them and don’t make them nearly enough. 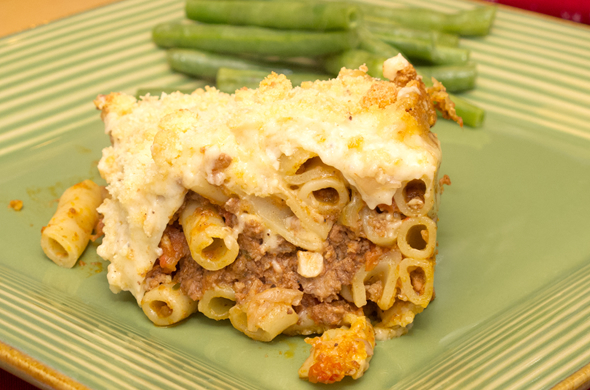 Homemade ones are sooo much better than store bought ones. I get it that folks dismiss them. I’m not vegetarian, but I can’t eat beef so I kind of have to like them. People who are lucky enough to eat beef without a problem don’t really understand and can mock them all they want. I love all the flavors, condiments, and options for burgers. 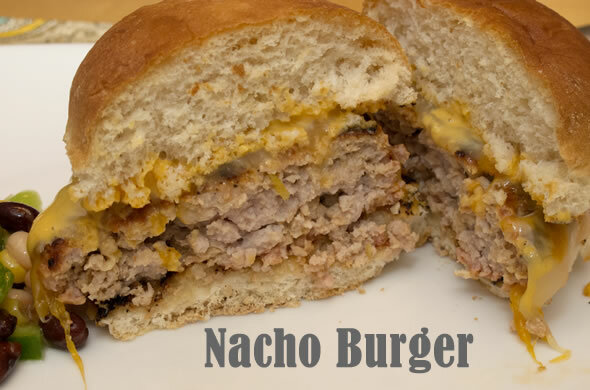 I usually make chicken burgers and some restaurants offer turkey burgers and they are pretty good substitutes. 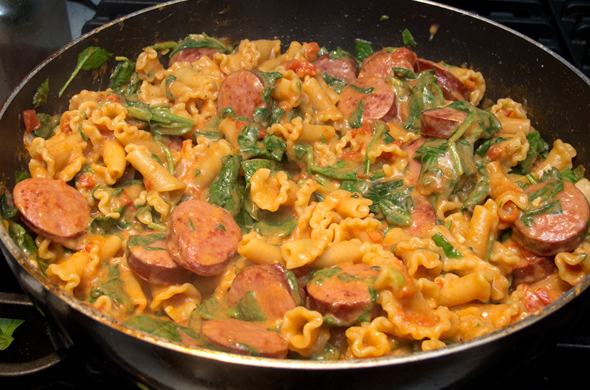 It is just such a quintessential summer food I miss out on. These are so simple, filling, hot-of-the-grill, and hearty. 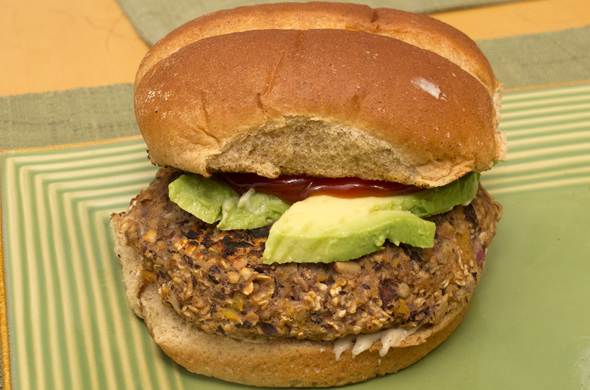 Veggie burgers are filling but not stuffed-can’t-think-about-food-again kind of burgers. I’ve made them with eggplant which I like but the nuttiness of the oatmeal and the crunch from the sunflower seeds is so great. 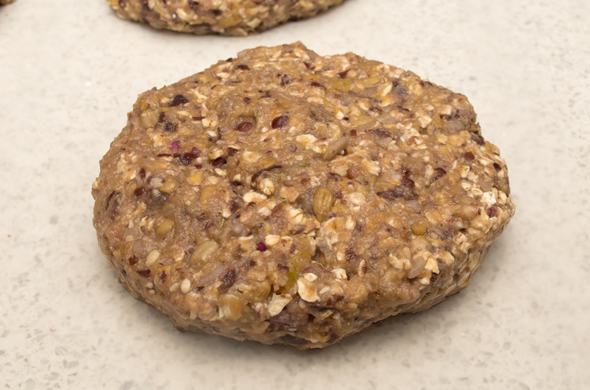 My friend Flying on Jessfuel made Sweet Potato & Pecan burgers a million years ago before we had blogs. The butternut squash in these brought me back to that million-degree apartment in Boston way back when. 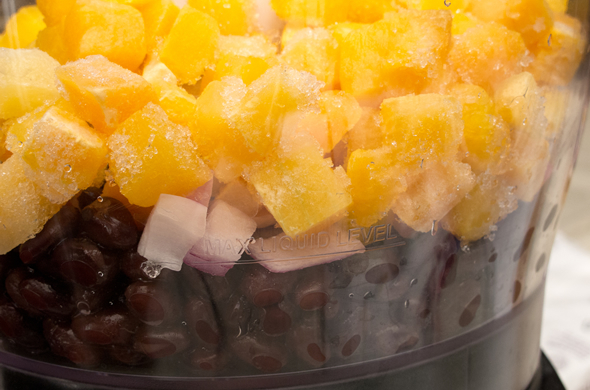 Add black beans, butternut squash (mine was still a touch frozen/frosty), onion, and garlic to a food processor. Pulse for a few seconds until mixed leaving some black bean chunks. Mix black bean mixture with oatmeal, sunflower seeds, egg, cheese, onion powder, and some salt & pepper. Grill until crisp on the outside. Flip once, gently. 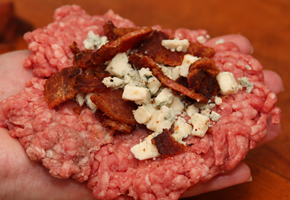 Serve on a bun with all the traditional burger ‘fixings or on salad or in a pita or bunless. I topped mine with avocado, ketchup, and some whole grain mustard we’re obsessed with on the bottom. It was so good. I froze the other 3 burgers separated by parchment. They’re ready and waiting for the next burger night! Mr. J saw me whipping these together (he formed his own beef burger) and saw something orange go in from the freezer. Mango? Hahaha, nope! That frozen butternut squash wasn’t our fav and it hung around so long he didn’t even think of it. He magically grilled this bad boy to perfection while I feared it would fall apart. He’s the grill-master for sure. Happy Monday! I’m back from a week-long vacation to Bermuda so even Monday is happy. It was such a great family trip and I will have some photos to share. Today we’re talking about brunch. I hosted brunch yesterday but my camera is still the residence to vacay & brunch photos, my luggage isn’t 100% unpacked, and I’m just happy to have a post for you. 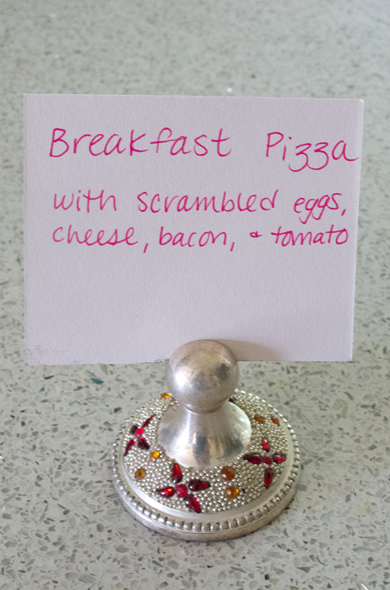 I’m still on vacation mode in the sense that I went to find this recipe’s inspiration on Pinterest. Then I discovered a pin for a fun party theme which lead me to a blog, which later lead me to my reader with lots of unread blog posts which distracted me from this post. Short & sweet it will now be! In a medium sauce pan, add blueberries, blackberries, sugar, blueberry sauce, cinnamon, vanilla, and heavy cream over medium-low heat. 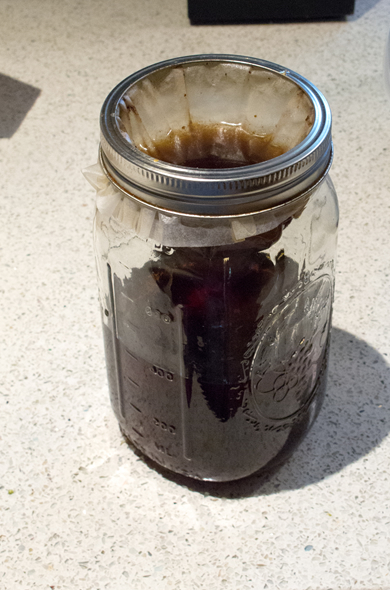 Stir well and keep an eye on it for when it gently boils. Turn the blueberry sauce to low once it has boils so it can thicken. 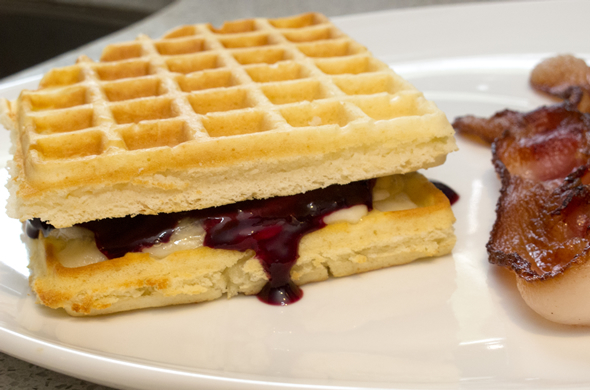 Assemble waffles with 1/2 waffle on the bottom, topped with sliced brie, then topped with blueberry sauce. 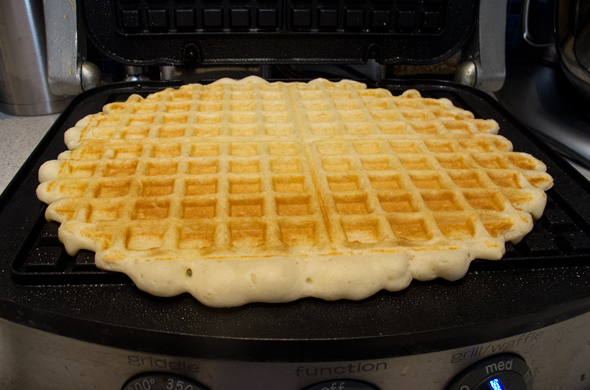 Finish it with the other 1/2 of waffle on top, or serve open faced. I loved this. 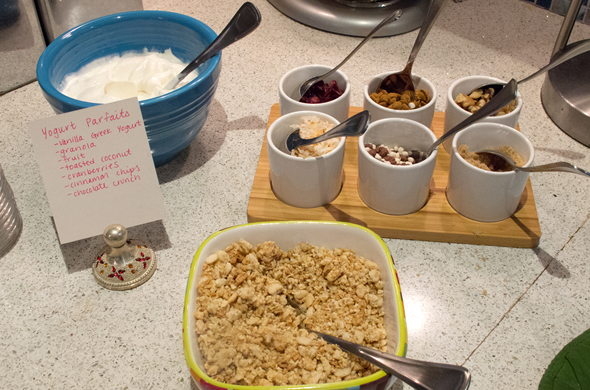 I like brie and I don’t usually seek out sweet breakfasts. I think this was a good sweet/savory balance. I prefer it cooked/melted. 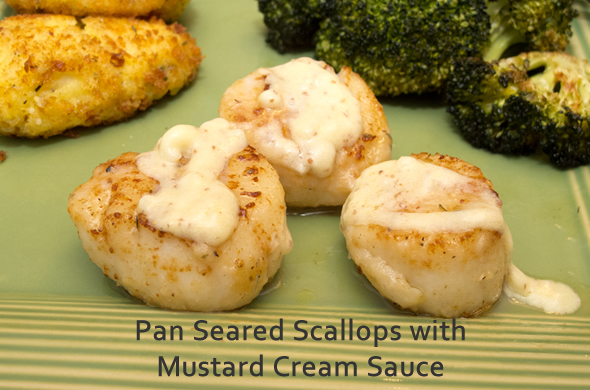 It is creamy and mild but has such a distinct flavor. 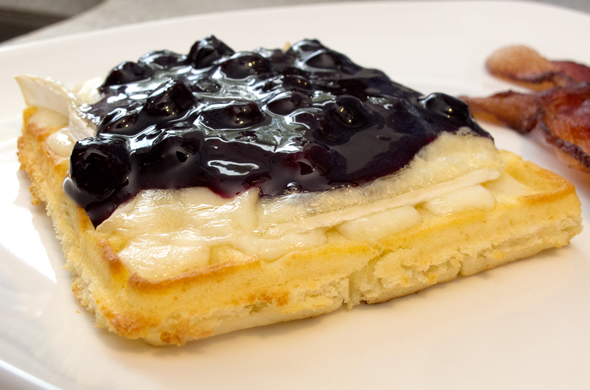 It gets gooey which is balanced by the crispy waffle and the sweet blueberries popped. It was perfect! 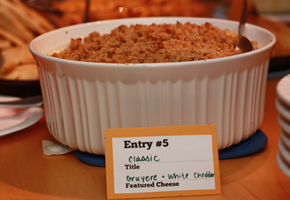 I usually eat/serve the rind on the brie, but that’s personal preference. I kind of cheated with the blueberry sauce. 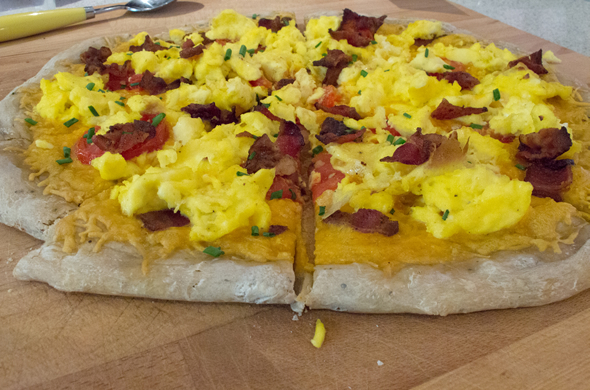 I had some from Stonewall Kitchen and really wanted to use it up. I added more blueberries and just a few other ingredients to liven it all up. The blueberries and blackberries were frozen and often appear in my smoothies. 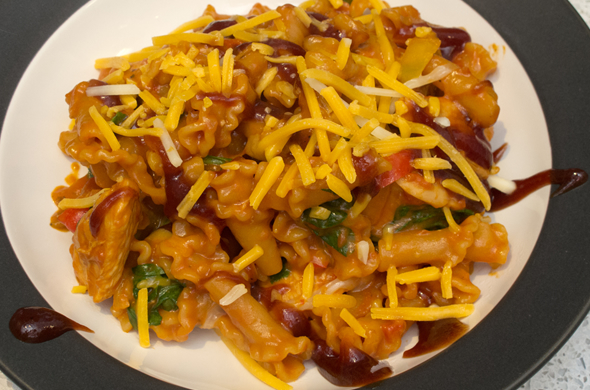 Frozen fruit is best suited to be cooked or made into a sauce after being frozen. I was using up stuff all over the place! I hadn’t cooked a special breakfast in months. It was so great to have this treat one Sunday after my event, before vacation. 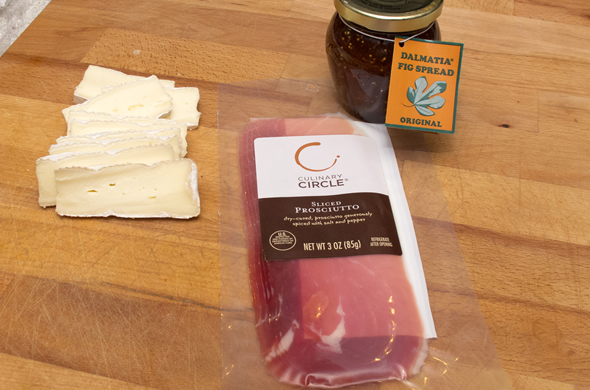 Need an idea for your leftover brie? 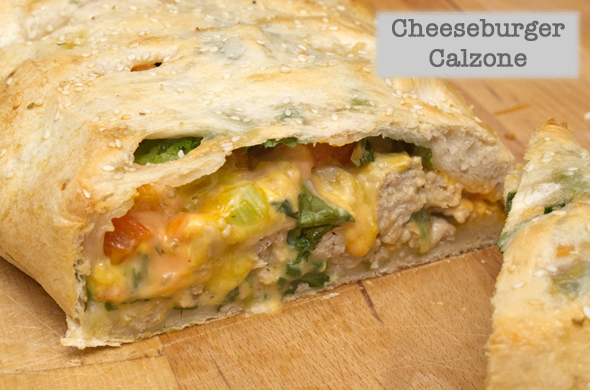 Try a cranberry, brie and turkey panini or my very favorite calzone with prosciutto, apple, and brie. I make it at home somewhat regularly and bake them. It is so much easier, less messy, and healthier. I’ve made them from scratch and honestly don’t really think it is worth it. I use a mix, bake them on a cookie sheet for 10 minutes at 375 degree and flip once. 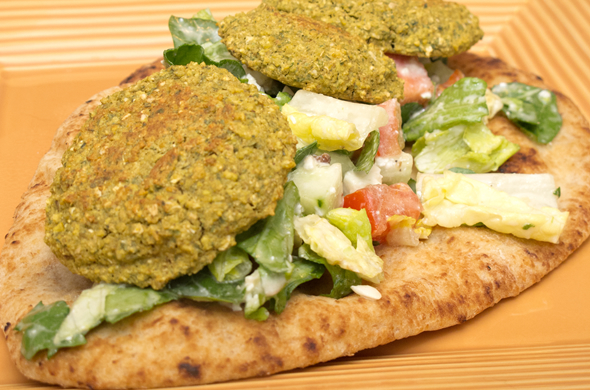 Leave the frying to your fav Falafel King/Palace/House-Of…you won’t even miss the fried crunchy outside. The mixes taste good and are simple. Simple as in just-add-water. In the time it takes to get these buggers toasty and cooked through your salad can be ready and waiting. 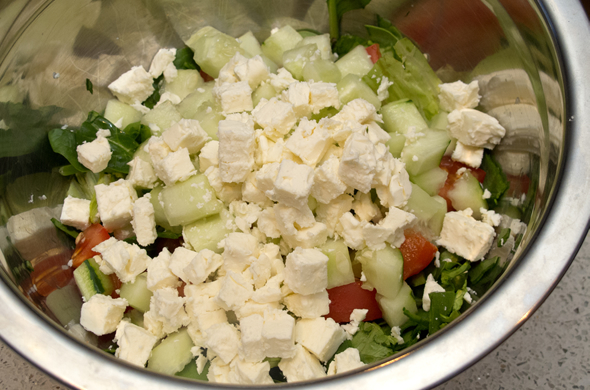 Toss feta, cukes, tomatoes, and greens with some Italian/Caesar/Oil & Vinegar. 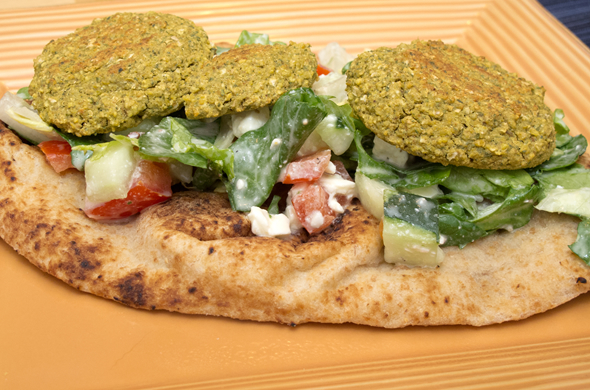 I love this as a perfect meatless dinner or I’ve served it as an app with little pita pockets. It is an easy meal to bring somewhere since you’ll just need refrigeration and maybe the falafel can get nuked or popped in the toaster oven. 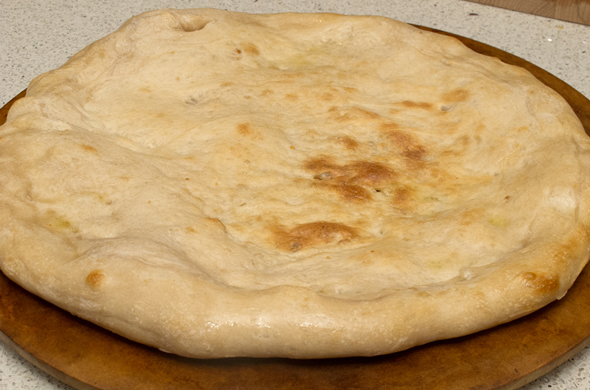 This time I served it on wheat naan but tortilla wraps, pita pockets are great too. Try it and I won’t even have to say told-ya-so.